Oh, the places we will go! : It's a love/hate thing. So, I love trains and I find riding the train across England to be very relaxing. I knew that my primary form of transportation in London would be the subway. I thought "no problem!" Not only are we not up in the air, we are actually below ground level. Can't get much safer than that. Yes, the whole system is 150 years old. And I am one of 4 million people traveling each day. And the cars are careening through small, dark tunnels at 50mph. And, yes, some of them do actually pass under the Thames and go as deep as 200 feet. Uhm. One sec. I just need to breathe into this paper bag for a moment. I've only used the Underground so far for relaxed travel around London. I'm not yet depending on it each day to get to and from work. I have my own little blue Oyster Card to get me on and off. I have no idea what "oyster" has to do with the Tube. According to Wiki... Oyster was conceived and subsequently promoted because of the metaphorical implications of security and value in the component meanings of the hard bivalve shell and the concealed pearl; the association of London and the River Thames with oysters and the well-known travel-related idiom "the world is your oyster". Oh-kay. It is a solitary experience, even though you are never alone. There is nothing joyful about the proximity to a hundred or a thousand individuals estranged one from another. The Underground is a deep pool of individual solitudes. Somehow "I" is now indistinguishable from "them." I probably shouldn't admit the inner workings of this brain, should I? And according to Mr. Ackroyd, it's not an uncommon reaction to the experience. Certain people are afraid of the Underground. The journey under the earth inspires panic and claustrophobia. It induces dreams of the fire and suffocation. You may experience what has been called the fear and madness of crowds. Once you are immersed in the other-land, removed from the familiar world, you may suffer from inexplicable terrors. Boy, I just can't wait until I'm using it every single day. I have yet to experience the crush of rush hour, or delays leaving you sitting in a dark tunnel for an hour, or "jumpers," or late night drunken shenanigans. The stories are endless and I'm bound to experience all of this and more. Pardon me while I grab the paper bag again. That is why most travellers are hurried in the Underground; they wish to arrive at their destination as soon as possible. The Tube system is devoted to finding the shortest route possible between two locations. It is not really a place at all. It is a process of movement and expectation. 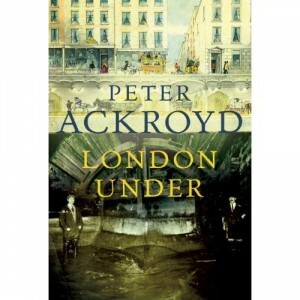 (Mr. Ackroyd's book is actually very interesting and full of amazing information about the world beneath London.) From what I can see, most Londoners have a love/hate relationship with the Underground. Here are some fun blogs and websites about the Underground.. Going Underground, Going Underground's Blog, Underground History. London's parks are said to be its lungs and the Underground its circulatory system. It is a crucial part of modern London and makes it what it is today. And so much history. It is the second largest metro system in the world and the 3rd busiest in Europe. It is the quickest and easiest way to get around London. Convinced yet? Me neither. But, I'm trying really hard to find the good stuff. Last week was mid-term break and all of the English schoolchildren swarmed into London to visit the museums. The wait to get into the Natural History Museum was about two hours. It was crazy! But, we happened to be passing through the South Kensington Station as the museums were closing. The train was full of children. It was terrific. The little ones haven't yet picked up on the required protocol for riding the Tube. They will actually... gasp!... make eye contact. I can't help but smile, they quickly look at their parents to make sure everything is okay. Then they glance back and return the smile. There are often prams on the trains with babies gazing about at all the faces around them. I've seen dogs on the trains. I've seen teens and tweens traveling in small groups. Women travel alone without a second thought. There are always people on the train who speak little or no English. I've seen several people on the Tube who are visually impaired and using walking sticks. I can't really go into histrionics with so many brave people about about now, can I? So, I will proceed cautiously with this new relationship, in the hopes that I will eventually find the love. But, I'm afraid I might to have to get back with you. I will keep the paper bag handy. The quotes you pulled from this book gave me chills! We recently rode the underground through evening rush-hour traffic -- with three kids -- and I was chilled by the distopic coldness of it all -- that 'blankness' you mention. Everyone stuffed cheek to cheek in a crowded car and: no talking, no smiling, no eye contact. It was unsettling. It also seemed like it would have been faster to just walk. =) Anyway, great post! I've been choosing walking or the bus lately. It's the best way to get to know the city. Thanks for the comment! Have you read any of Peter Ackroyd's books? They are full of great info, sometimes hard to read, but worth the effort. makers have developed a new breed of SUV; the crossover.